Baxter Jones after his arrest on July 18, protesting water shutoffs. Baxter Jones was arrested on July 18, 2014, while protesting the large-scale, inhumane water shutoffs occurring in Detroit. 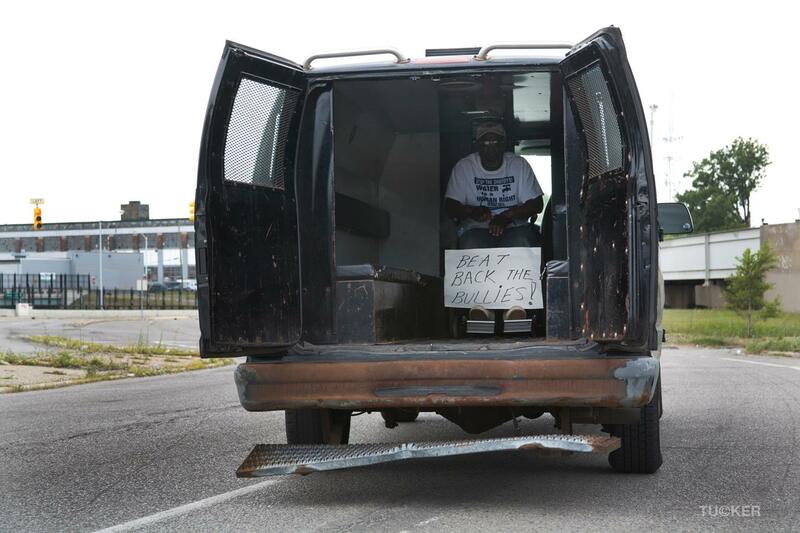 Baxter and eight other people were detained for blocking the trucks owned by Homrich Demolition, the company hired by Emergency Manager Kevyn Orr to conduct a water shutoff Blitzkrieg against tens of thousands of families in Detroit. Baxter, a tireless fighter for social justice, uses a wheelchair because of spinal cord and brain injuries sustained in an automobile accident. He was placed in the van shown in the above picture and transported to jail. His wheelchair was not tied down and the van did not have a seat belt for him to use! In addition, the van’s low ceiling forced Baxter to keep his neck in a bent position, resulting in injury requiring a neck brace. Please sign this petition for Baxter: Stop mistreatment of Baxter Jones and all people with disabilities! Stop the Detroit water shutoffs!